Very professional, friendly, on time, and they are experts. The product and the way they did business, they were straightforward and honest. 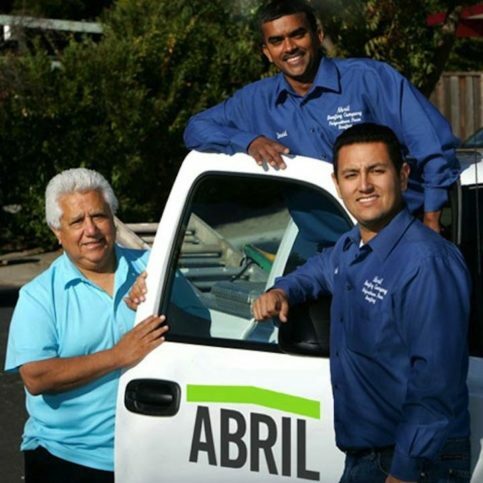 Abril Roofing, Inc. is a family-owned and operated roofing contractor that serves residential and commercial clients throughout the Bay Area. The company’s main focus is installing polyurethane foam roofing, but it also handles skylight installations and drainage system upgrades. Abril Roofing uses high-density polyurethane foam that contains nontoxic catalysts and environmentally-friendly additives. Mr. Abril Jr. says foam roofing is one of the most efficient roofing and insulating systems available. 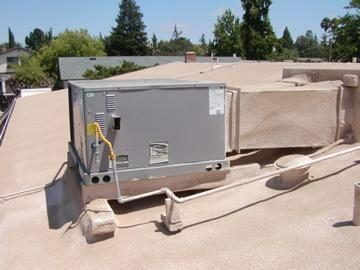 “It improves draining problems, reduces maintenance expenses with its unparalleled durability and uses its superior insulating properties to lower energy costs.” To keep customers’ roofs performing for a lifetime, the company offers maintenance programs that include semiannual inspections and cleanings. DIAMOND CERTIFIED RESEARCHED CAPABILITIES ON Abril Roofing, Inc.
Company Name: Abril Roofing, Inc.
DIAMOND CERTIFIED RESEARCHED ARTICLES ON Abril Roofing, Inc.
Abril Roofing’s technicians install a polyurethane foam roof. 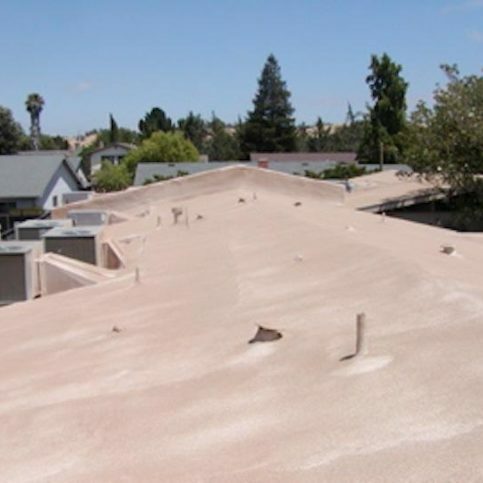 Foam roofing is designed for flat or low-sloping roofs that are commonly found on commercial buildings, although some styles of residential homes, such as Eichler homes, have them as well. 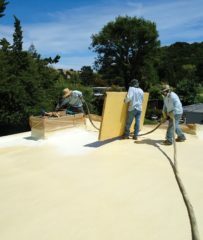 The roofing material is comprised of a layer of polyurethane foam topped with an acrylic surface. Since flat-roofed buildings usually don’t have attics, the foam provides insulation that can significantly reduce energy bills–reducing indoor temperatures by 10 to 15 degrees in summer and saving up to 30 percent on heating bills in winter. Also, when applied, the foam can be given a slight slope to improve drainage and prevent water from pooling. Abril Roofing provides a 15-year, transferrable warranty on its roofs and also offers annual maintenance agreements, which include semiannual inspections to clean customers’ roofs and ensure they’re draining properly. 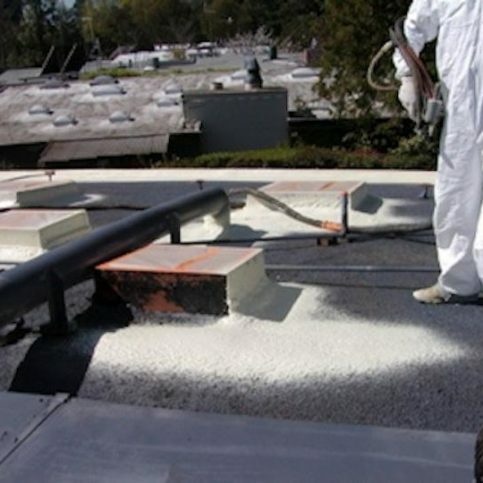 When installing polyurethane foam roofing, be aware of the quality of its coating. “Foams are pretty standard, but coatings range significantly in terms of quality and durability,” says Rick Abril, Jr., co-owner of Abril Roofing, Inc. “It’s important to ensure your contractor is using high-quality materials.” Coating prices range from $5 to $20 per gallon, and differences in estimated prices are often the result of the coating itself. Determining the best kind can be complex, so it’s best to simply ask your contractor what they use and why. Mr. Abril recommends obtaining multiple bids for foam roofing projects. 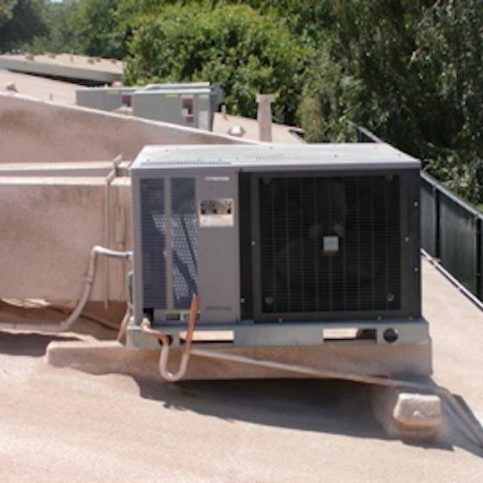 “Customers should talk to at least three reputable foam roofers and compare their differences. Some customers get two bids for traditional materials and one for foam, but that can be a mistake.” If you’re considering foam roofing, Mr. Abril says it’s a good idea to get multiple bids for the foam alone. Q: How is foam roofing applied? A: We apply it in three stages, with a different crew for each stage. Each crew is supervised by a single, dedicated foreman who ensures efficiency and understands the particular needs of different buildings. The first stage is preparation, during which our five-person team cleans and preps the roof. They’re followed by the installation crew, who spray the foam, and the wrap-up crew, who finish the job. Q: Can I walk on a foam roof? A: Yes. It’s not soft or spongy. We use high-density foam that’s very firm, strong and durable. Q: Is foam roofing difficult to install? A: Yes. It’s probably the most difficult roofing material to apply. The foam must be manufactured onsite by complex equipment. There’s a large learning curve; it requires highly specialized skills, which is why we use separate crews for each of the three stages. Q: How long does a foam roof take to install? A: Most residential roofs take three days to install. Q: Does the weather affect the installation? 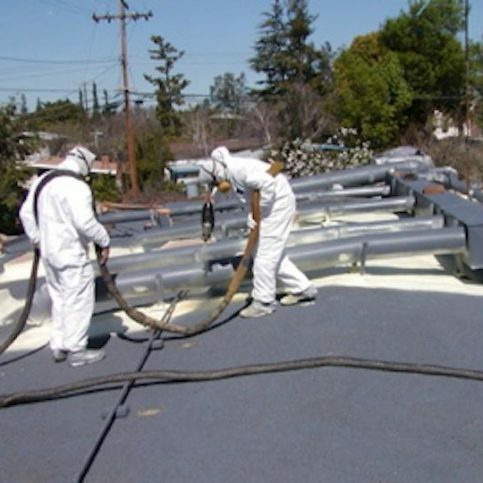 Q: Is foam roofing installation messy? A: All roofing is messy, and foam roofing is no different. But cleanup is in our contract—we clean at the end of every day and thoroughly at the end of the job. Q: Do I need a permit for foam roofing? A: Yes, but we’ll pull the permit for you. Q: What’s an Eichler home? A: Joseph Eichler was a pioneering housing developer in the 1950s. He constructed homes that were modern, elegant and moderately priced. 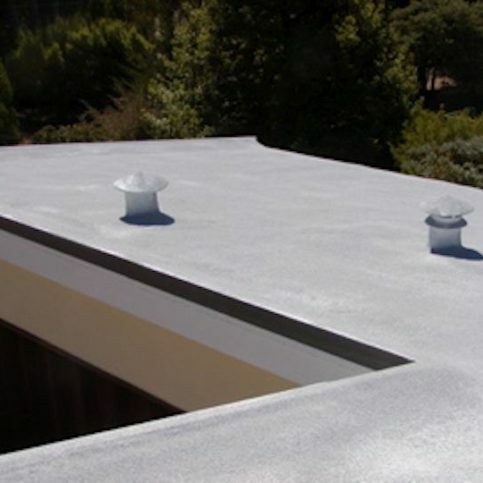 Eichler homes have flat roofs that are ideal for foam roofing. There are more than 14,000 Eichler homes in the Bay Area. Q: Do I have to worry about birds, insects or any other maintenance problems on my roof? A: No. Insects and birds won’t damage or crack a roof. The only maintenance issue is the acrylic surface, which will flake away over time, just like paint. Acrylic needs to be reapplied every 15 years, but it’s similar to painting a roof. SELECTED PHOTOS FROM Abril Roofing, Inc.
Diamond Certified RATINGS ON Abril Roofing, Inc.
Abril Roofing, Inc. : Average 8.9 out of 10 based on 271 unique customer surveys of customer satisfaction. They are very professional and they did what they said they were going to do. Just that they were on top of stuff. Polite, they clean up after themselves, and they follow up. We had a leak, but they responded right away, and they corrected it. They are local, and I am sure they stand behind their guarantee. Quick, and everything was good. I guess they were efficient. I thought they were very professional, and the information they said was correct. They started and finished when they said they would. When my gardener made a hole, they came out and fixed it. Besides being very professional and efficient, they were good communicators and nice guys. They are very reliable, and their customer outreach is very good. They are very nice people. They really work with you and make it feel like a custom job, not scripted. They were easy to work with, showed up when they said they would, and they did what they said they would do. They did a good job. They cleaned up when they left. They work well with me in coordinating jobs, since I've been using them for so long. They were professional, straightforward, and they had a good price. They did a good, clean job. I am a real estate agent, and I have already recommended Abril Roofing to clients and other agents. Unfortunately, roofers in general don't have the best reputation and a lot of them are there today and gone tomorrow. Getting roofers to come back and fix something can be really difficult, because they just disappear. Abril Roofing have been around a long time, and they are really tops. I felt like they were ethical. They explained everything in very specific detail, and they gave us pages and pages with lists of satisfied customers and their phones numbers so we could call and get recommendations. My husband did do that, and it was very helpful. We didn't have to chase down references. It was really nice. The quality is good, and the roof will last a long time. They explained everything very well, and they did a good job. Richard is great. He explained everything well. The crew came out, cleaned up, and knew what they were doing. I had a few changes to make, and they took care of them. They are reliable, on time, they clean up well, and they have good pricing. They left the place clean when they left. I'd say to give them a call and see if the price is right, because they offer a good service. They seemed professional in the work that they did. They were very professional and reasonably priced. I liked how fast they were. Out of all the contractor's I've used, they were the easiest to work with. I liked how pleasant the whole experience was.